Ganesh Utsav is a spectacular festival, honoring Lord Ganesha. The elephant-headed god is worshiped for 10 days from Bhadrapada Shudha Chaturthi to the Ananta Chaturdashi. It is celebrated all over India, but the maximum grandeur is witnessed in Mumbai and across Maharashtra. He is known to be the Lord of Power and Wisdom. He is the eldest son of Lord Shiva and Goddess Parvati, elder brother of Skanda or Kartikeya. He has as his vehicle a small mouse. The significance of riding on a mouse is the complete conquest over egoism. He is the Lord who is believed to remove all obstacles on the path of the spiritual aspirant, and bestows upon him worldly as well as spiritual success. He is the Lord of Harmony and Peace. It is believed that worshipping Lord Ganesha during the festival will bring Good luck and prosperity to the family. 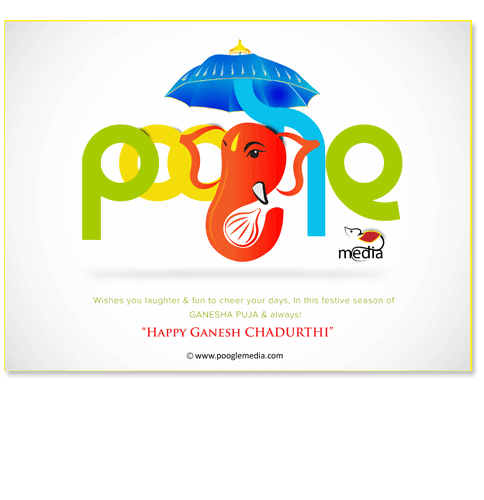 Poogle Media designed a poogle doodle marking this sacred and prosperous day.